Menlo Park one Saturday a month! From 8:00 AM through 6:00 PM, a full day (Ten Hours) of Amateur Radio fun and excitement for all. Our SEVENTH Year at the SLAC National Accelerator Laboratory! Donation-financed morning snacks (coffee, donuts, bagels, etc.) are provided along with the lunch of hot dogs, hamburgers, "veggie burgers", chips, potato salad, soft drinks & all the tasty usual items. A shared GOTA (Get On The Air) HF Station available for use all day. Setup your Amateur Radio and/or computer equipment with the available AC power in our prepared areas; right outside is our excellent antenna field for your antenna experimentation & operation. Our HF "GOTA" Station will be available from 9:00 AM to 6:00 PM. Show your pride by wearing your Radio Club badge. Radio Station K6YA on air for 9 hours — An Exclusive Monthly Feature! Hams of all license classes (including no license) are invited to operate the GOTA station under the guidance of our control operator(s). We've lost our great location at SLAC, so the activity is suspended while we look for a new location. Stay tuned for new a new location and dates. We plan to have an activity area, including a picnic area to practice and demonstrate our amateur radio skills. Beginning in October, 2004 at the Sunnyvale Baylands Park, followed by several years (2005-2011) at the SLAC National Accelerator Laboratory in Menlo Park, many individuals involved over the years have made the Am-Tech Day experience an interesting one, indeed. The activity's duration, spanning most of the day and into the evening, allows Amateur Radio Operators and their friends to attend before, and/or after, any additional daytime/evening tasks and activities they need to accomplish. Please bring and wear your Ham Radio organizational name badge if you have one! We will also have temporary name badges available for your use. The participant supported lunch with hamburgers, hot dog's, veggie burgers, chips, soft drinks, etc., will be on hand to enjoy. Even if you don't have a radio or antenna to bring, come anyway, and get to mingle, make new friends, and have a chance to use some of the gear other hams have set up. Bring your family and friends! We usually have at least one lecture on the latest ham technology. But if the lectures don't interest you, mingle with the crowd, and you'll surely find another ham that can teach you about operating in general or about the latest cool thing. on the FARS Announcement email list. Sponsored by the Foothills Amateur Radio Society. SLAC is providing the space, but you bring all the equipment and food you need. A BBQ grill, charcoal, and refrigerator are available. Show a photo ID at the gate, and sign-in at the table inside the building. AC power supplies and amplifiers must be UL-listed, have a similar safety endorsement, or be approved by the SLAC Electrical Safety Officer. A limited number of AC outlets are available inside and outside, but since we're not allowed to plug power strips into extension cords, bringing along a 35'-100' extension cord with multiple built-in outlets would be quite helpful. Gel-cell batteries 50 amp hours or less are allowed, so long as there are no exposed conductors. Use electrical tape, shrink-wrap, or similar materials to cover the terminals. No wet-cell batteries or car/truck batteries are allowed. Alcohol, firearms, flammable liquids, and other dangerous weapons are strictly prohibited. We have free use of this great site, but we need to comply with the SLAC, OSHA, and fire marshal safety rules. For those who are curious, we need to comply with NFPA-70E and OSHA 1910 (subpart S) electrical safety regulations. Amateur Radio Technology Day can be reached easily from Highways 101 and 280. SLAC is located off of Sand Hill Road, less than a mile east of Interstate 280 (towards the bay). From U.S. 101, turn west onto either University Avenue or Embarcadero Road, then turn right (north) onto El Camino Real and then left (west) onto Sand Hill Road, and continue approximately 2.6 miles west, turning left at Saga Lane. From Interstate 280, turn east (towards the bay) onto Sand Hill Road, and proceed approximately 0.8 mile, turning right at Saga Lane. 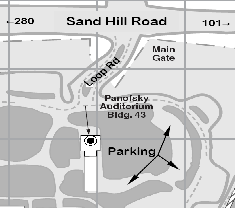 Once you turn onto Saga Lane, turn left after the guard shack onto Loop Road and follow the signs to the parking lots below Panofsky Auditorium, located around the bend (Parking lot C). Park and walk up the concrete path to the buildings.